I adore everything she makes and she pretty much has my dream fabric stash. You would not believe the rare and out of print fabrics she has. Can you say "jealousy"? A five minute shopping spree in her fabric closet would be almost better than winning the lottery. "Hello to everyone at Joy's Hope. My name is Terri , I am a mother to one beautiful angel named Sophia, and wife to a wonderful husband named Rob. I started sewing at 15 teaching myself from library books and sewing on a vintage green and white Singer machine. From then on I was hooked, and 15 years later I am the owner of a great creative outlet called Sew-Fantastic. I started my shop about 2 years ago when I was pregnant, looking for a way to be able and stay home more with my little girl. I discovered Etsy last October and I am truly in love. Etsy as well as the blogging world, have been creative outlets for me, as well as my inspiration that comes from my family. I am truly blessed with everything I have been given and hope that I to can make a difference in someone's life the same way mine has been impacted through my blessings. I hope that everyone here finds their creative outlet and inspiration the same way I have, it really is a wonderful feeling to make something with your very own hands." It all began with crayon wallets. Beautifully designed, carefully crafted and charming. I am thinking that my crazy monkey Lucy might even be able to occupy herself for lets say, at least two minutes when armed with this cuteness. This is pretty much my favorite boy fabric. What little guy wouldn't want to be awesome at guitar and art? Did I mention that they are machine washable? That is honey to a mother's ears. Especially one with stain removal OCD. Her newest addition is the Sketcher Wallet. Perfect for the tween who has outgrown the crayon phase, but still has the passion to create. I wouldn't even mind sketching in style. I truly believe that you are never too old to color. This classic and funky Designer Carryall Clutch will save my sanity during the next few months. Moving, appointments, remodeling and general chaos can all be contained within it's stitched goodness. A place for everything, and everything in it's place. Plus a matching pen to boot. She had me at hello. Come back and tell me what your fave item it. 2. Make a purchase from her shop. A winner will be drawn on Friday, September 4th at noon. i love the orange kitty wallet!!! I love that print & my gracie would too!! So I am totally in love with the carryalls! Paisely of course! how perfect for a craft show?!?! Of course my girly would love the sketch book one. The vintage kitchen carryall clutch is my fav! I would use it to write down recipes and my grocery list. Such a cute shop. Thanks so much for the introduction! My favorite is the designer carry all! Even the Skecher is great! I love visiting Terri's blog. I left a comment on her blog! I love her scraps! I have a slight addiction! 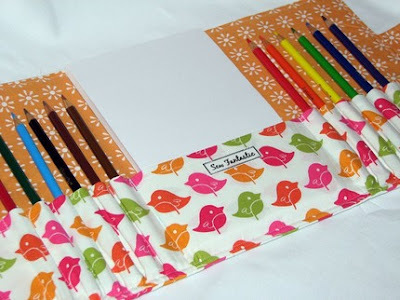 But as for something homemade, the cream owl crayon holder is adorable. I have tried and tried to make one for my daughter but can't seem to quite get it right so winning one would be perfect! I bought a crayon wallet pattern from her at the beginning of the year to make for my 4y/o bday. She loves it! I have to pick only one!?!? OK I LOVE Children's Coloring Crayon Wallet HOT PINK FROGS Hip Trendy Toddler Travel. These will make great gifts!! I love the owlie clutch. You were right her fabric is amazing. I love the crayon wallets. Those are great for occupying the kiddos at restaurants. Plus they would make great gifts! Thanks for sharing this fabulous shop with all of us! Hard to choose a favorite when you love it all, but this Crayon Wallet IMAGINATION STATION Coloring Wallet Crayons and book Included is so adorable! Wee one would love it :) she's really into coloring! I love the carry all clutch!! My favorite is the Designer Carryall Clutch FORTUNE IN AQUA On the go Daily Organizer, But it was VERY HARD to choose! I love the Aqua Seahorse Carry-All Clutch!! Love "Designer Carryall Clutch MORNING GLORY On the go Daily Organizer". I love the good folks fortune carry all. But I also love the sketch wallet. I know a special little girl that is getting that for Christmas!! My favorite is the Designer Carryall Clutch OWLIES On the go. So cute and useful too! Designer Carryall Clutch GOOD FOLKS FORTUNE On the go Daily Organizer is my favorite but those crayon wallets are very tempting. I love the carry all clutch in the blue bird print....so cute! I really like the sketcher wallet - my son does not like to use crayons - so holding pencils is great! and I love the link to flickr to pick the fabric for a personalized item! I just love the sage carryall clutch! That is one of my favorite Amy Butler prints! Too cute! my favorite item is definitely the carryall clutch, but i can't decide which fabric! i love it! The Sage Wallflower Carryall Clutch. My fav is the carry all clutch in black damask! Can see a ton of uses for this beauty! Thanks for the giveaway! My fav is the LIL PRINCESS crayon wallet. I like the cogsmo robot fabric for the crayon clutch. Finding cute boyish fabric is hard. I left her some comment love! Oh how adorable is everything? It was hard to choose but I adore the Designer Carryall Clutch BLACK DAMASK On the go Daily Organizer! So cute. I left her some blog love! I love her carryall clutches. Especially the Owlie one. Thanks for the chance to win. I want....no, I NEED the sage wallflower caryall-so cute!! Love the shop! I think after about 5 or so times going over and over again.... I love the NEW ITEM - Sketcher Wallet FRIPPERY great color matching on all your items... these are great items for gifts..
oh my goodness, I love that paisley carryall clutch and the green sock monkey wallet. She has the BEST fabric choices! That carry-all clutch in the black and white damask fabric is To. Die. For. I love the Sketcher Wallet. I really like the carry all clutches, I think either the morning glory or the sage wildflower are my two favorites from her selection. I am not sure if I like the pink monkey crayon wallet for my daughter, the cool guitar sketcher wallet for my son who is in art, or the birds caryall for myself the most! Beautiful fabrics! My favorite is the Owlie carry-all clutch. So cute, and useful, and darling. I LOVE the Purple Blooms clutch! So stinking cute! My 6 year old is officially in LOVE with ALL the crayon wallets! Just left a comment on her blog! I left a comment on her blog. Oh! I like the artist wallet with the large polka dots and pink pindot inside. Fabulous! And the adult carry all is a great idea, too! I loved this: Children's Coloring Crayon Wallet 2D ZOO Crayon Wallet. All her items are beautiful!! I visited her blog and left her some love on her fabric bracelet posting. Cute! You know I'm going to be crafting some of those tomorrow!!! I love the carryalls...so fun and hip! So adorable and usefull! I love the Sketcher Wallet FRIPPERY the best. I left her some comment love!! i visited her blog and left some love. The Owlie carryall clutch is my favorotist of all. I like the designer carryall since at the moment I don't have small children for the crayon wallet. I love the Dinosaur crayon holder! My nephew just started kindergarten and he loves dinosaurs. This would be THE ultimate present for him! I visited Sew Fantastic and left a comment. She's also on my Bloglines. I left a comment on her blog, it's awesome! Morning Glory carry all cluth for me please! I bought a crayon wallet earlier this month and it is certainly all that and a bag of chips! Very nice indeed! I left some blog love for Terri! I have to say I am going to be totally selfish with this giveaway and not say my favorite item is the crayon holder for my daughter. Because I want/need the Designer Carryall Clutch AQUA SEAHORSE On the go Daily Organizer!!!!! Hum wonder is I win will I end up with a crayon holder?! I love love the black damask carryall clutch! I love the camo one and the little birdie one! So so cute! I think my favorite item is the Designer Carryall Clutch FOR THE BIRDS On the go Daily Organizer! I love it! Left her some comment love! I just LOVE the Designer Carryall Clutch in GOOD FOLKS FORTUNE. And know just the friend to give it to for Christmas!! Just became a follower of her blog AND commented on her giveaway post. I love the owlie carryall clutch! although if I won i would probably get a crayon wallet, i've been thinking they would make a good Christmas gift! Left a comment at Sew Fantastic, i love her blog! I'd like the Good Folks Fortune carryall clutch for me, but I know my girls would love their own crayon wallet too! I love the Carryall Clutch in the Morning Glory fabric! I think the robots and rockets toddler wallet is so cute, that fabric is perfect for my goofball. I also visited her blog, left a comment, and am now following her! I like the CREAM OWLS crayon wallet! I LOOOVE the Purple Blooms Carryall Clutch! 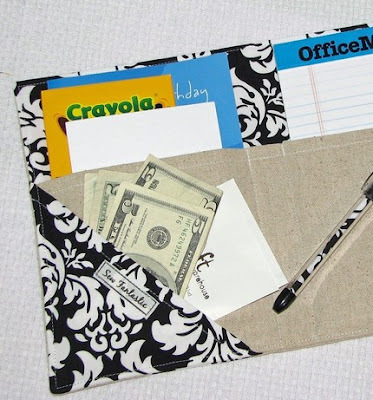 This would be so helpful for me to keep with me whenever I need to have my notes, or papers to match for my cards and such. Love it! Visited her blog and commented! Just left her a comment! Okay, this may not be what you wanted, but my answer is ALL...every single scrumptious item. Each one I paused and imagined the bday party for the many lil' ones in my life that would delight in these lovelies. And the Mommy's in my life...pure bliss. Crossing my fingers and toes! Left some comment love @ ST! I love Designer Carryall Clutch VINTAGE KITCHEN. I could see myself getting good use of this at the grocery store! the carryall clutch in morning glory. oh yes! I love the crayon wallets! I also like the carryalls! I love her stuff. Especially: http://www.etsy.com/view_listing.php?listing_id=29790580 My son would love it. I love the frippery birds fabric...that would be awesome..or the anna maria fortune one! I made a purchase for a gift, but would still love to win one!! 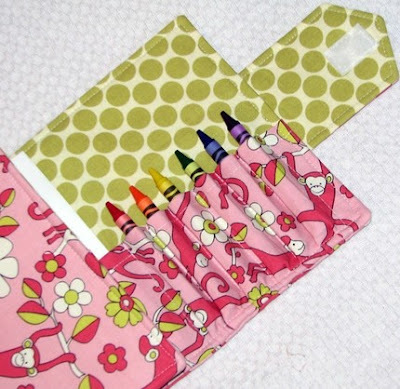 I just received 2 crayon wallets that I ordered last week--they are a serious hit! Off to buy the pattern! by far my favourite thing she makes! Left her a comment...and forgot to say I also love the vintage kitchen organizer!! i love the carryall, and i totally need one! my purse is a paper and crayon graveyard! I LOVE the for the birds print. comment love sent to sew fantastic. she really is awesome! I love the panache paisely carry all. I wish I had the sewing talent that abounds around here! I like the Crayon Wallet Birthday Party Pack! I visited her blog and left of comment! hooray! I love the Sage Wallflower Designer Carryall Clutch!! I visited her blog and left a comment. My favorite item is DEFINITELY the carryall clutch! The sage wallflower fabric looks great with that design. I love the owls too. If I were to win, it would be tough to decide! LOVE the carry alls - can't decide if I like the pink and yellow or the one with the big pink flower the best. These are so cute! My favorite is teh Designer Carryall Clutch BLACK DAMASK On the go Daily Organizer! Thanks for the chance to win. I love the Designer Carryall Clutch BLACK DAMASK On the go Daily Organizer. That fabric is fabulous! I love the orange kitty cat crayon carrier.......so cute!! I really like the Carry All Clutch! I can't decide between the Fortune in Aqua print or the Black Damask! I checked out the blog as well. She has a lot of great inspiration there. I love the Orange Kitty crayon wallet. . . SO CUTE!!!! I have been searching for a nice organizing solution for my restaurant/department store coupons. The Designer Caryall Clutch would work great! I adore the RED Sock Monkey Crayon Wallet...TOO cute!! i love her carryall clutch in morning glory!! OOO, the contest ends on my 10th wedding anniversary, hope I win. I love Joy's American Jane Wee Play and Pez Charm Packs beautiful selection, I can imagine the quilt already. I totally wrote Joy instead of Terri, sorry. My wee man is tugging at me and I am a lil' distracted. I will choose the designer carryall clutch in vintage kitchen. I am constantly jotting down recipes while at the computer on all this little scraps of paper..this will help to keep it contained and all neat and tidy! I left some bloggy love on the cute video she had of Sophie boogying down! I love the Designer Carryall Clutch VINTAGE KITCHEN On the go Daily Organizer!!!! It is so cute and it totally matches my kitchen!!! I left come comment love on her blog! love the vintage kitchen carryall... so cute for menu/grocery planning! I love the sage wallflowers too though. love her blog!!! the rainbow wonky log cabins are so cute! my daughter would love the Sketcher Wallet XOXOXO the CAT, so cute! I like the Designer Carryall Clutch GOOD FOLKS FORTUNE On the Go Daily Organizer. Just commented on her blog. Um the carryall clutch in Sage Wallflower much!? I think I'm in love. :) Thank you for introducing this lovely item!!! how to choose....i love the carryall clutch, i can't even begin to pick a color/pattern. but i know i'm going to buy a crayon clutch for my 2 yo - her 3rd birthday is aroudn the corner!!! I just LOVE the carryall clutch! every single pattern too! and I visited her blog and commented! My son would totally love the crayon wallet in the Bot Camp design. I left a comment on Terri's blog. I love the carry all clutch. I would carry this to church with my Bible. Thanks for the chance to win. I love the Designer Carryall Clutch in the GOOD FOLKS FORTUNE print. I would carry it with my Bible to take sermon notes. I love the cupcake coloring wallet! I love the aqua sock monkey wallet. Super cute!! the blog; I would love to make that wonky cabin rainbow quilt. Beautiful colors and design. Love the Crayon Wallet Hip trendy toddler travel Monkey Around Crayons and book Included! I don't think I can. Ohhhh my... I think the vintage kitchen carryall clutch is so great. P.S.-- I commented on her blog! I love the carryall clutch! Might just have to buy one! "American Jane Wee Play and Pez Charm Packs OOP and Hard to find" I love this fabric collection...it just makes me want to sing! My favorite is the Designer Carryall Clutch BLACK DAMASK On the go Daily Organizer :) *Thanks* for the giveaway! too cute I love them all! My favorite is the lime monkeys! I am a huge sock monkey fan! Just posted on Sew Fantastic blog....does that count for another entry???? yipee! I love the crayon carry with the apples on it...really cute!! Thanks!! I have left a little message on her blog...thanks!!! I love the Carryall Clutch with the apple fabric, so cute! I'd love the pattern to make the crayon books! I'd make all of my daughters little friends ones for Christmas! I left a congratulations message on her blog. I love the crayon wallets! My son is into all things crayon, animals and his daddys guitar, so I think my favorites would be the zoo wallet and the guitar wallet. What a great giveaway! I have been a follower of hers for a long time and never cease to be amazed at all she accomplishes. I love her crayon cases and the journal covers. I left a little comment congratulating her on her products being sold in many boutiques! 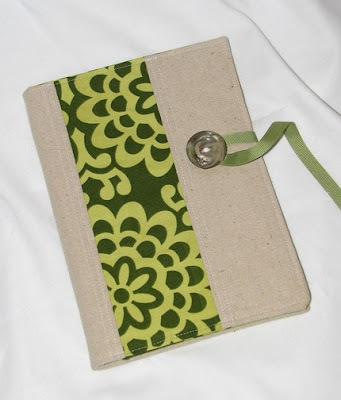 ok...I looked at sew-fantastic's esty site...pretty much everything is sooo adorable! If I was going looking for myself, I looove the carryall clutch in the aqua seahorses or aqua fortune pattern. Fabulous! I love all of the fabrics. It's a hard choice, but I think I'd go with the Carryall Clutch. I also visited the Sew Fantastic blog and left a comment. Fun stuff! Love the Designer Carryall Morning Glory Clutch... so cute!! I love almost everything on her site. There's so much cuteness! My favorite is the crayon wallet Imagination Station. I really love them all...I wonder were she gets her fabric! 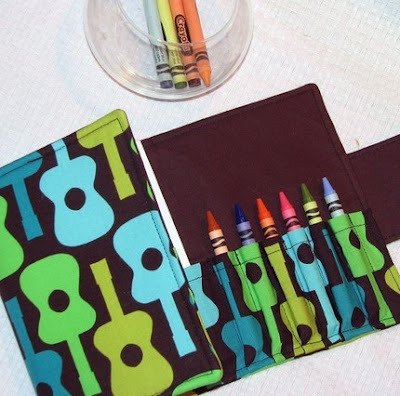 I love the apples & pears crayon wallet! I left a comment on Terri's blog too. Her items are really great! I love the designer carryall in black damask, but I also love the crayon wallets with the zoo print. Great stuff. Thanks! I love the Tweet Tweet crayon wallet! I really love the Designer Carryall Clutch MARTINI DOT PINK On the go Daily Organizer! A carnival of tiered trays.